Was there ever any in our society? I stalk the headlines of major newspapers and magazines daily, seeking examples where people have used common sense in solving problems. It's a barren landscape out there in the American hinterlands and cities. The lack of common sense has manifested itself in two of the most unpopular presidential candidates for major political parties in U.S. history. How could anyone with common sense have let this happen? Look to the stresses in our society - racial unrest and a disappearing middle class - and how they evoke visceral emotions that cloud common sense. 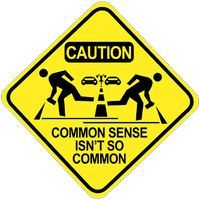 With all the experts in our society why isn't there a correlation between schooling and common sense? I've known people with master degrees that lack basic common sense, and people with high school educations (or GED equivalents) that are well grounded in common sense. As Victor Hugo suggested, "Common sense is in spite of, not the result of, education." Here's a column I wrote for the Times-Standard newspaper in Eureka, California, three years ago talking about common sense.